N1 WI on the BBC! 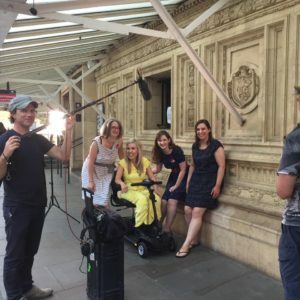 A few weeks ago, we were invited to be part of filming for a segment by the BBC all about the song Jerusalem, its connection to the WI and women’s suffrage, and how we felt about the song today. The segment was part of the Last Night of the Proms on September 10th, celebrating 100 years since the music for the song was written. You can see us here on BBC iPlayer for the next couple of weeks, about 50 minutes in. We talked to the lovely Nikki Fox outside the Royal Albert Hall, and even had a sing! We had a great time and it was lovely learning more about the song and its history. Thanks to the lovely people at the BBC for getting in touch and for making us feel so at ease!